TUESDAY NOVEMBER 29TH FROM 6AM TO 8PM. A WIN ! WIN! Amador Community Foundation gives this nationally recognized annual giving campaign a special local twist. By making ONLINE donations at giveamador.org on Tuesday, November 29th between 6am and 8pmPacific Time, your dollars go further, thanks to incentives of $10,000 from the Helen Fallis Fund. The Interfaith Council of Amador County works to eliminate hunger and its causes because no one deserves to face the day hungry. The Interfaith Food Bank is the major hunger relief organization serving 6,000 Amador County residents suffering from food insecurity. Please visit giveamador.org November 29th between 6am & 8pm. Together we can all fight hunger! Sermon: Wake Up and Pay Attention! Are you ready? Get set…GO! So where exactly are you going? Do you have a plan? And if you do not have a plan for the future, then what are you living for? Today is the first day of Advent, that season of the church year which calls us to get ready, to stay awake, to pay attention to what is happening in the world, to see the signs and wonders of God in our daily lives, and if those signs and wonders are being sabotaged by our society, to actively participate in getting rid of those obstacles that hinder God’s ways. The season of Advent initiates the church’s liturgical year. Unlike the school year which begins in September, or the calendar year which begins in January, the Church’s year begins today. So happy new year! The word advent comes from the Latin meaning “the coming.” For Christians, the season of Advent anticipates the coming of Christ from three different perspectives: 2000 years ago in Bethlehem, daily in our hearts, and finally the coming of Christ in all his glory in the fullness of time. In contrast to some Eastern religions that view time as an endless cycle of birth, death, and rebirth, Christianity looks at time differently. It begins with God’s creation of the world and culminates with a total transformation of creation, where compassion is the operating principle. Instead of God’s time being cyclical, the way of the Lord is a trajectory whose arc is long but bends towards justice and peace. The challenge with embracing the season of Advent is that most folks already have their minds set on Christmas. In my neighborhood, the Christmas lights and trees are up, the presents have been purchased by Black Friday, and Christmas carols are already being sung. I understand why there is such a rush towards Christmas. Deep within our psyches is a desire to experience joy and delight; to spend happy times with friends and family; to marvel at the sparkle of lights and decorations; to eat, drink, and be merry, and to put aside (even if it is only for a short time), the trials and tribulations of life. But without some internal spiritual preparation, Christmas joy will be hard to come by. So I suggest that you might set aside some time each day during the season of Advent to pay attention. You might find some value in taking a look at the bigger picture and pondering the excitement and hope that can arise in your life when the coming of Christ is nurtured in your heart, within your family, and in your society as you listen to the quiet promptings of the Holy Spirit in whom you live and move and have your being. Steph and I set aside time for the nurturing of the spirit with the lighting of our Advent wreath and with the reading of Advent meditations. It is time well spent that can delight the mind and make the heart glad. During the season of Advent, the assigned biblical readings often focus on the second coming of Christ. Today’s gospel story is a case in point. If you read all of Chapter 24 in Matthew’s gospel, you will notice that the early disciples were very concerned about the end of time and the second coming of Christ. In this chapter, Jesus speaks about the destruction of the temple in Jerusalem, wars, famines, earthquakes, and persecutions. Fearful times can cause people to draw fearful conclusions. The early Christians were no exception and they interpreted these cataclysmic events of the time as a sign that the world would soon end. They were wrong. Taking a few passages out the biblical text and weaving them into a theology, there are many people who believe in an apocalyptic ending to the world that is soon to come. There are movies, books, and music that make millions of dollars promoting this kind of thinking, utilizing an elaborate theology that was developed in the late 1800’s. This kind of theology is best “left behind.” This theology tends to highlight passages like today’s gospel where Jesus says: “Two will be in a field; one will be taken and one will be left. Two women will be grinding meal; one will be taken and one will be left behind.” However, Jesus does not say that one is right and one is wrong or one is faithful and one is not. He does not say that one will be raptured up to heaven while the other is left behind on earth. However, he does say that both should keep awake, pay attention to what is happening right now, be observant of what is happening in the world and where the spirit of God is working. In other words, don’t just go through life being fat and happy, unaware and uninvolved. Wake up! Isaiah believed that regardless of where the power seemed to lie in the present time, the day is surely coming when God’s reign will be established for all humankind to see. This is the future that I believe in even though I am fully aware that our world is in turmoil today. But despite all the chaos and hurt in our society, I do not give way to despair or hide my head in the sand or become cynical in my speech and action. Instead of embracing an apocalyptic ending to human history, I believe in the evolution of human consciousness. Because of this belief, I work toward that end, opening my heart to seek and serve Christ in all persons, loving my neighbor as myself. I continue to pray for God’s grace to lead me from a place of fear to a place of love, seeking healing for life’s traumas, and practicing forgiveness so I can become a mirror that reflects the light of Christ. And so, on this first day of Advent, I invite all of you to join me in staying awake and preparing the way of the Lord. In 1925, Adolf Hitler made a political comeback and published his personal manifesto, Mein Kampf. Benito Mussolini (Il Duce) announced he was taking over Italy and his fascist’s party of Blackshirts marched into Rome. Having endured chemical warfare, the agony of defeat of WWI, and the economic depression following the Treaty of Versailles, there was a lot of collective depression among the Europeans, especially the Germans. This led to desperation, civil unrest, and power grabs among the conservatives, the left, the right, and the middle. People were looking for a political solution to heal their pain. It was into this context of political instability and scapegoating that the Church instituted the Feast of Christ the King. Its purpose was to remind all Christians that Christ is our king and that no political solution can ultimately solve a spiritual problem. It was also a reminder to the faithful that Christ, and Christ alone, was to rule over their minds, wills, hearts, and bodies. Today, we are celebrating this feast day, recommitting ourselves to our baptismal covenant to seek and serve Christ in all persons. It is this spirit of Christ reigning over our society that will ultimately bring world peace. In my opinion, the institution of the Feast of Christ the King back in 1925 failed in its attempts to hinder the zealous, political, and violent sentiments of the people of Europe, and many people suffered. At first, the Nazi regime came for the communists. And since most of the Germans were not communists, there was not a large outcry. Then they began to round up the so-called incurables, those who were senile, feeble, deformed, or had some chronic disease. These “incurables” were seen as a burden to society and thus dispensable. Then came the “final solution,” the extermination of the Jews. Then they came for the Trade Unionists, and I did not speak out—Because I was not a Trade Unionist. Then they came for the Jews, and I did not speak out—Because I was not a Jew. Perhaps you can understand why the people of Germany were seduced into supporting the Nazi Party. They were frustrated after years of war, bullied by the Allies, and struggling to make ends meet. Their railroads were in disarray, their economy floundering, their military defeated, and their hospitals and schools struggling. In a sincere desire to return to their old way of life, they cashed in their freedom to make Germany great again. Believing that a strong political leader could “save” their nation, they bet on the wrong horse. It is into this tension between the desire for a better life and the oppression of innocent human beings that we read today’s gospel of the crucifixion of Jesus. In the story of the crucifixion, we see Jesus being scapegoated by the powers that be. Yet as “King of kings” he exercises his power in the midst of mockery, coercion, and arrogance: "Father, forgive them; for they do not know what they are doing!" In his second act of power, Jesus confers mercy on a convicted criminal: "Truly I tell you, today you will be with me in Paradise." Mercy, forgiveness, compassion, reconciliation…this is the spirit of a true King, the one who can save us, the one who brought God’s reign of justice and mercy to earth, and the only one who deserves our full allegiance. Ultimate allegiance to anyone else will ultimately end in failure. Today, we are going through a challenging period in our country. Our nation is divided, the common people’s voices are not being heard, and our citizens have had enough. There is great concern over the infrastructure of our cities and highways. There is disappointment in the economy and the inability for many to find meaningful work and earn a living wage. Our hospital system has become a profit-making enterprise, prioritizing profit for stock holders over the well-being of patients. Many still do not have access to good medical care. Schools are being privatized, leaving those on the lower end of the economic spectrum with few good choices. The gap between the rich and the poor gets wider. These are all very important issues that have left us disturbed and disoriented. And like the post-WWI Europeans, we as a nation must improve the quality of life for all people. But as we address each of these problems facing our nation, we must remember to choose the path modeled by our king, Jesus the Christ. If we do not learn from history, we will repeat it. Our path must be paved with our baptismal promises to seek and serve Christ in all persons, loving our neighbor as ourselves. It must include our spiritual toolbox of forgiveness, reconciliation, generosity, wisdom, justice, mercy, peace, and respecting the dignity of every human being. "First they came for the Muslims, and I did not speak out—Because I was not a Muslim. Then they came for the Hispanics, and I did not speak out— Because I was not a Hispanic. Then they came for the Minority, and I did not speak out— Because I was not a Minority. I don’t know who wrote this reflection but I hope I will have the courage to speak out before it is too late. Like many of you, I am a mixture of several different nationalities, including Irish, English, and German. My great-grandparents included Catholics, Lutherans, and Church of England. And while my people struggled as immigrants when they entered this great nation, I am a product of this great melting pot of humanity. I was fortunate enough to have been born an American, free to choose my religion and path. But it has not always been easy for me. Like many of you, I was denied equal access to athletic opportunities as a young, female athlete until Title IX was passed. As a gay person, I was discriminated against by the laws of the land. But over time, justice prevailed and I give thanks to God and to this great nation for bestowing upon me the human rights needed for life, liberty, and the pursuit of happiness. It is my prayer that we will honor the great spirit of our country, granting to all people- life, liberty and the pursuit of happiness. So how will this love of all of God’s children blossom and be made manifest? When we claim Christ as our King, all things become possible! Everyone is invited and encouraged to participate in the 11th annual Las Posadas Candlelight Walk on Saturday, Dec. 3 at 6:00 PM in Sutter Creek. This tradition, which has its origin in Spain, begins on Spanish Street near Immaculate Conception Church. Participants are given candles and programs. The procession is led by Mary riding her mule, Joseph, shepherds and angels, following the way which is lighted by luminarias. Musicians lead everyone in Christmas songs, and narrators tell the traditional story. Several times the procession stops while Joseph knocks on doors seeking shelter. Winding its way through downtown Sutter Creek which is blocked off to vehicles, the procession arrives at a stable in front of the Methodist Church. 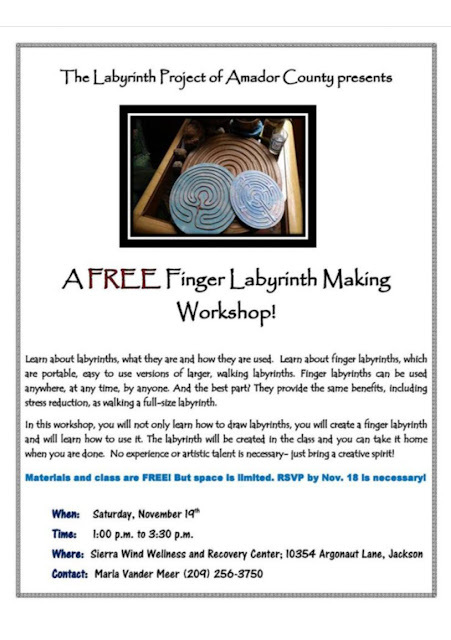 Afterwards, everyone is invited into the social hall for homemade cookies and warm beverages. 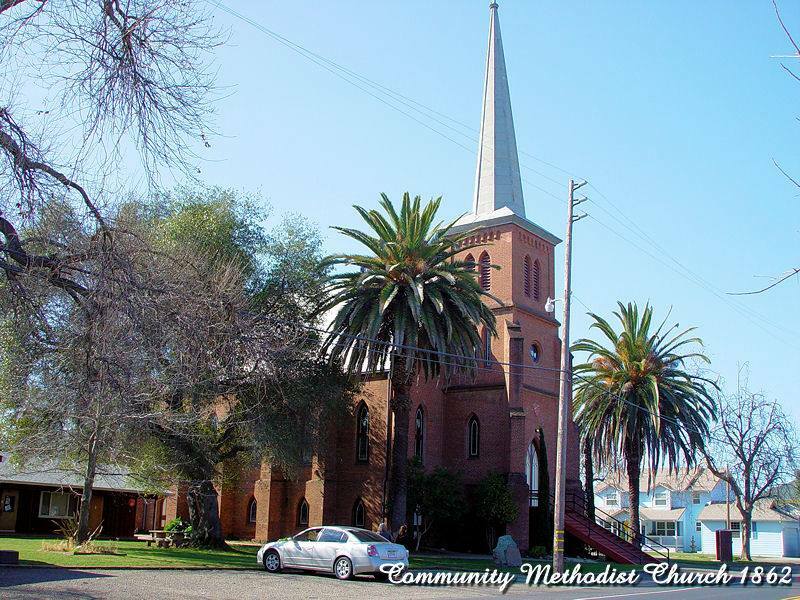 The Candlelight Walk is sponsored by the Methodist, Catholic, Baptist, New Life, and Episcopal churches of Sutter Creek/Sutter Hill. What a wonderful way to begin the Christmas season! Piccolina, owned by Andy Assereto, is a handsome 20 year old mule which has the important duty of carrying Mary in the Las Posadas Candlight Walk. This community tradition will take place at 6:00 p.m. on Friday, December 3 for the 11th season. 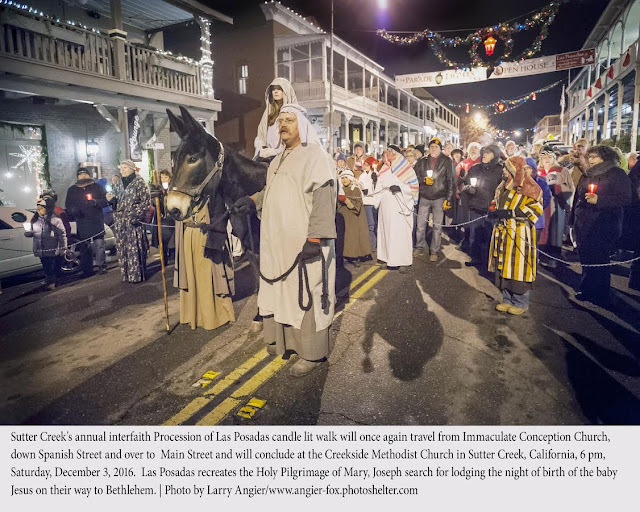 Over the years, Las Posadas has grown to involve hundreds of people who look forward with anticipation to participating in this re-creation of the story of Mary and Joseph seeking a place of shelter. Andy is a retired firefighter who has always been around ranches and animals. A friendly and thoughtful fellow, Andy obviously has a deep rapport with his mules. He spends time each year working with outfits around the Bishop-Lone Pine areas, leading groups of people who ride mules on trails in the mountains of the Sierras. Andy speaks affectionately about each of his mules, describing their personalities. He expresses the firm opinion that mules are very smart, more intelligent than horses. 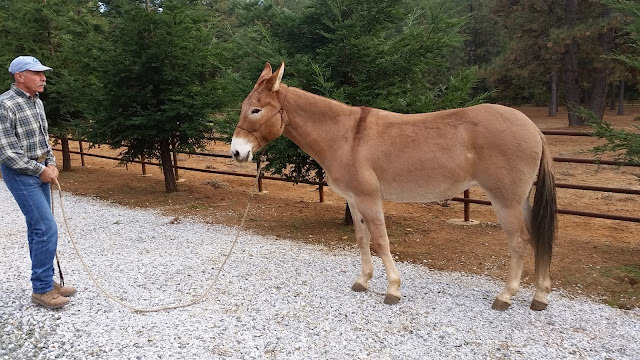 A mule can be taught anything, he says- it just requires patience on the part of the teacher. About Piccolina, he says that he has probably ridden her a couple of thousand miles in the mountains, and that anyone can ride her. Please do come and enjoy being a part of Las Posadas, and meeting Piccolina! What saint in your life has had the greatest influence on your faith? Who were the people (past and present) who have encouraged you to take the higher road, to temper justice with mercy, and to seek and serve Christ in all persons including those on the margins of society? There are several who stand out for me. I think of St. Laurence of Rome, a 3rd century deacon who suffered persecution at the hands of the Emperor. Given three days to turn over the treasures of the church, Lawrence worked swiftly to distribute as much Church property to the poor as possible, so as to prevent its being seized. On the third day, when ordered to give up the treasures of the Church, he presented the poor, the crippled, the blind and the suffering, and said: “These are the treasures of the Church.” As you can imagine, this didn’t go over very well with the Romans and Laurence was put to death. I’ve also been influenced by groups of people who were willing to sacrificially offer their time and talent for the good of society. For instance, in 1878, yellow fever invaded the city of Memphis for the third time in ten years. 30,000 citizens had fled in terror while 20,000 more remained to face the plague. When the worst was over, 90% of the population had contracted yellow fever and more than 5000 people had died, included many of the Anglican Sisters of St. Mary’s. These faithful servants became known as “The Martyrs of Memphis,” brave women of God who remained in the city to give relief to the sick, comfort the dying, and homes to the orphans. I am also influenced by modern day saints like Mahatma Ghandi who said: “You must be the change you wish to see in the world” and Martin Luther King Jr. who worked tirelessly for justice, peace, and the dignity of every human being at the cost of his own life. And of course, every time I go into Jane’s Hall, I think of Jane Boitano, a beloved elder of Trinity Church who died in 1987 but whose memory is very much alive; a faithful servant who effusive welcome, caring spirit, enormous energy, and generous stewardship kept Trinity thriving through the good times and the scarce times. What all of these saints had in common was their faith in God, their willingness to sacrifice for the greater good, a spirit of compassion and justice, and a desire to serve. It is into this context of compassion for others that we celebrate All Saints Day. The text assigned for this holy day is Luke’s version of the beatitudes, The Sermon on the Plain. Four blessings form the introduction. It is a little bit different from Matthew’s Sermon on the Mount, although the message is the same. These sermons instruct Jesus’ disciples how to act compassionately in a world that cares little about the underdog. At this point in Luke’s gospel story, Jesus and his disciples have come down from the mountaintop onto a level plain. A great crowd of people from all over Palestine have come to hear him and to be cured of their physical, mental, and spiritual ailments. As Jesus looks out at the crowd, he sees two groups of people: Those who are on the edge of desperation and those who have the power to make a difference in the world. He first turns his attention to those who are stuck in poverty, hunger, pain, and persecution and he blesses them: Blessed are you who are poor. Blessed are you who are hungry now. Blessed are you who weep. Blessed are you who are despised. Blessing others (especially those in need) is one way to assure them that they are valuable human beings and thus important in the eyes of God. When we bless another person, our compassion and commitment to their well-being increases. This is a gift, which when freely bestowed, can offer hope to a broken world. Last week, I attended a seminar given by Marianne Williamson. She encouraged the audience to begin each day with 5 minutes of prayer before getting out of bed. This time of prayer is to include blessing those whom we will come in contact with during our day: Our family, friends, colleagues and those we will meet on our daily routines. Imagine spending a moment to bless the people we are about to meet- like before going into a store or a vestry meeting or dinner with our family. With a spirit of blessing in our hearts, it is sure to enhance our communications and make their hearts glad. After addressing the desperate crowd, Jesus then turns to the folks who are privileged and have the power to influence society in a positive way. 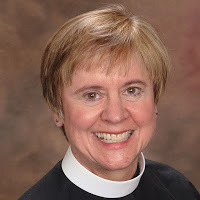 His words are harsh: Woe to you who are rich, woe to you who are full now, woe to you who are laughing, woe to you when all speak well of you.” The Sermon on the Plain can be a very difficult passage for the privileged and powerful to hear because it calls on us to change the way we do business. It is challenging because it means that we are going to have to make some sacrifices in order to provide for the poor, the hungry, the suffering, and the persecuted. However, for those of you who long for a world that is peaceful and just, today’s gospel passage is good news brimming with hope; a pathway that can unite all of God’s creatures. Today, our society has divided its people into categories: the winners and the losers, the successful and the left behind, the rich and the poor, elites and uneducated, whites and blacks, men and women, citizens and immigrants. Clearly, in each of these categories, one group has more power and therefore access to more resources while denying the less powerful their fair share. But this is not God’s vision for our world and so we must never participate in supporting such injustice. Because Jesus blessed the poor, we who have resources need to share ours generously and work to dismantle unjust economic systems that cause poverty. A spirit of generosity and compassionate voting, make a big difference. Because Jesus blessed the hungry, then we who have food are required to share and work diligently to end hunger. Thanks to all of you who support our feeding programs and who will give generously this month to provide Thanksgiving baskets to those who are “food insecure” here in Amador County. Because Jesus blessed those who weep, we who follow in his footsteps are called to comfort those who mourn and reach out with a healing embrace of care and concern. We must not turn away from the pain and suffering of others because it makes us uncomfortable. Finally, because Jesus blessed those who are hated, excluded, and reviled, we who are in the mainstream must work tirelessly for human rights and the dignity of every human being. Today we celebrate All Saints Day, a time when we cherish the memory of those who have gone before us. Some of them struggled like we do to remain faithful to Jesus’ teachings of compassion and service to others. Some, whom we remember today, have lived up to the gospel precepts in spectacular ways. The communion of Saints includes many people with many different abilities, each of us given gifts for the building up of God’s kingdom. So whether you are a courageous disciple or one who is just “inching towards the kingdom,” you have the ability to bless others, to care for the plight of your neighbor, and to work diligently to dismantle all structures, patterns, laws, and sentiments that cause the suffering of many at the hands of a few. Compassion, not purity, is what it means to be a saint. “The first principle is that Christ needs to be the foundation and chief corner stone.” Without Christ as our foundation, the church will never be able to withstand the trials and tribulations of today’s culture wars where self-centeredness and consumerism try to seduce us from upholding our baptismal covenant. “The second principle is that you, the body of Christ, are the building materials.” This means that God has given you gifts, not to be hoarded for yourself, but to be offered in service for the building up of the church and for the well-being of our society. 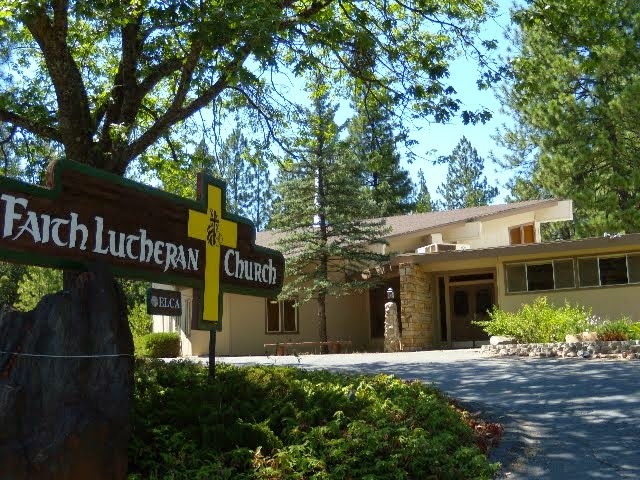 “Finally, no church can be built up without having a detailed construction plan.” And while Trinity Church in Sutter Creek has a strategic plan to thrive into the future, without the spirit of God moving through our hearts, our minds, and our hands, that plan will not come to fruition. So we continue to pray for grace as we bless one another. Pope Francis has challenged our world to live a life of mercy and kindness: “You pray for the hungry. Then you feed them. That’s how prayer works.” This summarizes today’s gospel in a nutshell.